Hey there! Thanks for dropping by Fibers of the Day! Take a look around and grab the RSS feed to stay updated. See you around! 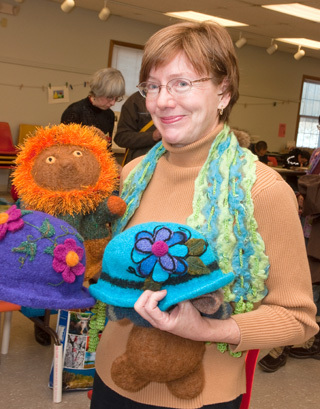 Two felted wool hats and a hand puppet embellished with needle felting. I am thrilled to be partnering with Robin McCahill (www. intuit2arts.com) at the Gallery on the Green Art Show in Litchfield, Connecticut on Saturday, June 12, 2010. We will have nuno felted silk scarves, felted wool bags and hats for sale as well as jester stick kits. There will be some quilts and decorative items too. Stop by We would love to meet you at the fair.